Call 780-986-5912 for more information about becoming a vendor at LWAS events. In 1990 a group of locals came together to form the Leduc West Antique Society (LWAS). Their purpose was to collect, restore, maintain and display historic buildings, vehicles, antiques and other items used by the pioneers who settled this area in the late 1800s and throughout the 20th century. 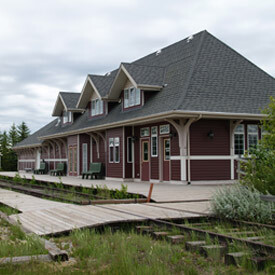 The idea was to preserve the history of Leduc, Calmar, Thorsby and surrounding communities for future generations to give them a glimpse of what life was like in times past. Leduc West Antique Society was established in 1992 when LWAS purchased 80 acres of land west of Leduc. The land was little more than a trackless swamp at the time, but has since been built into a rather impressive pioneer museum that not only hosts LWAS functions but is available to rent for weddings, reunions and other special events. Today LWAS boasts about 225 members from Alberta, Saskatchewan, BC , including lifetime and active members. As a registered non-profit organization, LWAS can collect donations and issue receipts for tax purposes. In fact, LWAS operations rely on donations, government grants and volunteers, as well as monies earned at BINGOs and casinos. Over the years, LWAS has gladly accepted donations of several historic buildings, such as the Ohrn House and the Dniester School. 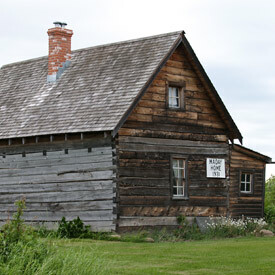 As well, several replica buildings have been built at the park, including an authentic Black Smith Shop where members of the Western Canadian Blacksmith Guild use old methods and antique tools to create artifacts for the park. LWAS hosts several events throughout the year that are open to the public, as well as hosting school tours and private tours upon request. Annual events include the May Tractor Pull and Country Swap Meet, the Annual Exposition in July and the Country Harvest every September. Visitors are invited to tour the historic buildings and check out the various displays and demonstrations. Vendors are generally on hand to sell their wares to the visitors and food concessions are generally available, as well. For those with limited mobility, most buildings at the park are handicap accessible, there are designated parking spots and special 'people movers' on the grounds duringthe Annual Exposition. Please note that none of the grounds are paved. The site is gravel and grassed areas. Volunteers are the lifeblood of LWAS, giving generously of their time and energy for planning events and restoration projects, maintenance of the buildings and upkeep of the park grounds.